52. STEPHEN9 MERRILL (JOHN8, NATHANIEL7 +MERRILL, NATHANIEL6 *MERRILL, NATHANIEL5, JOHN4 *MERRELL, THE YOUNGER, JOHN3 *MERYELL, JOHN2, THOMAS1) was born September 11, 1700 in Haverhill, Essex, Mass, and died April 28, 1746 in Metheun, Essex, Mass. 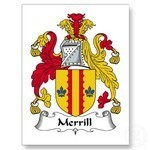 He married ABIAH (.....) MERRILL Bef. 1728 in Metheun, Essex, Mass. She was born Aft. 1700, and died Unknown. Stephen(4) Merrill (John(3), Nathaniel(2)) was born 11 Sep 1700 in Haverhill, MA and died 28 Apr 1746 in Methuen, MA. In 1718 he was living in York, ME with his brother John, but returned to Haverhill and later removed to Methuen. He married Abiah (Merrill). Children of STEPHEN MERRILL and ABIAH MERRILL are: i. DEBORAH MERRILL10 BARKER, b. April 16, 1728, Metheun, Essex, Mass; d. Unknown; m. (1) ZEBEDIAH BARKER, JR., March 8, 1748/49, Metheun, Essex, Mass; b. January 8, 1719/20, Metheun, Essex, Mass; d. 1780; m. (2) JOHN PLUMER, Abt. 1795; b. Abt. 1728, Hamstead; d. Unknown. ii. HANNAH MERRILL, b. March 6, 1729/30, Metheun, Essex, Mass; d. Unknown. iii. ABIAH MERRILL, b. March 13, 1731/32, Metheun, Essex, Mass; d. Unknown; m. PHILIP NELSON, Plaistow, NH; d. October 6, 1756. iv. MOLLY MERRILL, b. February 14, 1745/46, Metheun, Essex, Mass; d. Unknown. v. HEPZIBAH MERRILL, b. January 18, 1733/34, Tewksbury, Mass; d. Bef. 1781, Haverhill, Essex, Mass; m. JONATHAN HARRIMAN, April 3, 1777, Haverhill, Essex, Mass; b. June 19, 1721, Haverhill, Essex, Mass; d. December 23, 1792, Haverhill, Essex, Mass.